Paired box protein Pax-6, also known as aniridia type II protein (AN2) or oculorhombin, is a protein that in humans is encoded by the PAX6 gene. Pax6 is a transcription factor present during embryonic development. The encoded protein contains two different binding sites that are known to bind DNA and function as regulators of gene transcription. It is a key regulatory gene of eye and brain development. Within the brain, the protein is involved in development of the specialized cells that process smell. As a transcription factor, Pax6 activates and/or deactivates gene expression patterns to ensure for proper development of the tissue. Mutations of the Pax6 gene are known to cause various disorders of the eyes. Two common disorders associated with a mutation are: aniridia, the absence of the iris, and Peter's anomaly, thinning and clouding of the cornea. Scientists have created a "tae" model using mice during which time the mouse does not express Pax6. The "knockout" model is eyeless or has very underdeveloped eyes further indicating Pax6 is required for proper eye development. PAX6 is a member of the Pax gene family which is responsible for carrying the genetic information that will encode Pax-6 (protein). It acts as a "master control" gene for the development of eyes and other sensory organs, certain neural and epidermal tissues as well as other homologous structures, usually derived from ectodermal tissues. However it has been recognized that a suite of genes is necessary for eye development, and therefore the term of "master control" gene may be inaccurate. Pax-6 is expressed as a transcription factor when neural ectoderm receives a combination of weak Sonic Hedgehog and strong TGF-Beta signaling gradients. Expression is first seen in the forebrain, hindbrain, head ectoderm and spinal cord followed by later expression in midbrain. This transcription factor is most noted for its use in the interspecifically induced expression of ectopic eyes and is of medical importance because heterozygous mutants produce a wide spectrum of ocular defects such as Aniridia in humans. Pax6 serves as a regulator in the coordination and pattern formation required for differentiation and proliferation to successfully take place, ensuring that the processes of neurogenesis and oculogenesis are carried out successfully. As a transcription factor, Pax6 acts at the molecular level in the signaling and formation of the central nervous system. The characteristic paired DNA binding domain of Pax6 utilizes two DNA-binding domains, the paired domain (PD), and the paired-type homeodomain (HD). These domains function separately via utilization by Pax6 to carry out molecular signaling that regulates specific functions of Pax6. An example of this lies in HD’s regulatory involvement in the formation of the lens and retina throughout oculogenesis contrasted by the molecular mechanisms of control exhibited on the patterns of neurogenesis in brain development by PD. The HD and PD domains act in close coordination, giving Pax6 its multifunctional nature in directing molecular signaling in formation of the CNS. Although many functions of Pax6 are known, the molecular mechanisms of these functions remain largely unresolved. PAX6 protein function is highly conserved across bilaterian species. 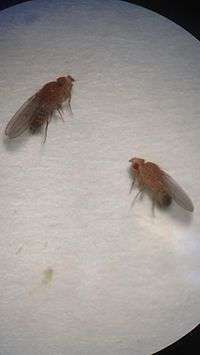 For instance, mouse PAX6 can trigger eye development in Drosophila melanogaster. Additionally, mouse and human PAX6 have identical amino acid sequences. Genomic organisation of the PAX6 locus varies considerably among species, including the number and distribution of exons, cis-regulatory elements, and transcription start sites. The first work on genomic organisation was performed in quail, but the picture of the mouse locus is the most complete to date. This consists of 2 confirmed promoters (P0 and P1), 16 exons, and at least 6 enhancers. The 16 confirmed exons are numbered 0 through 13 with the additions of exon α located between exons 4 and 5, and the alternatively spliced exon 5a. Each promoter is associated with its own proximal exon (exon 0 for P0, exon 1 for P1) resulting in transcripts which are alternatively spliced in the 5’ un-translated region. 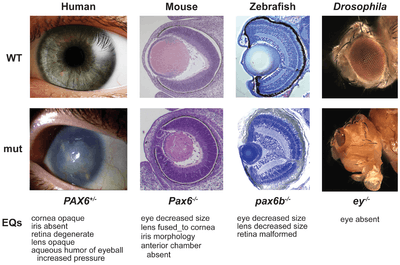 Experiments in mice demonstrate that a deficiency in Pax-6 leads to decrease in brain size, brain structure abnormality leading to Autism, lack of iris formation or a thin cornea. Knockout experiments produced eyeless phenotypes reinforcing the gene’s role in eye development. ↑ Jordan T, Hanson I, Zaletayev D, Hodgson S, Prosser J, Seawright A, Hastie N, van Heyningen V (August 1992). "The human PAX6 gene is mutated in two patients with aniridia". Nat. Genet. 1 (5): 328–32. doi:10.1038/ng0892-328. PMID 1302030. ↑ "Genes and Mapped Phenotypes." National Center for Biotechnology Information. U.S. Pax6 is a gene in prenatal development referred to as a transcription factor (activator and repressor). This means that Pax6 is a protein that binds to specific DNA sequences and activates or represses the genetic information delivered to mRNA. Pax6 is controlled by the signaling molecules Wnt1 and FGF8 and regulates eye, brain, and pancreas development. This gene is involved in patterning the midbrain. Nonsense mutations of Pax6 can lead to a condition called Aniridia which is associated with brain, olfactory, and pancreatic abnormalities. A study showed that progression of Aniridia can be stopped by application of a topical drug associated with this condition. National Library of Medicine, 12 Apr. 2014. Web. 14 Apr. 2014. "PAX6." Genetics Home Reference. U.S. National Library of Medicine, 7 Apr. 2014. Web. 14 Apr. 2014. "PAX6 in Sensory Development." Human Molecular Genetics. Oxford Journals, 15 May 2002. Web. 14 Apr. 2014. Shengxiu, Li, Dan Goldowitz, and Douglas J. Swanson. "The Requirement of Pax6 for Postnatal Eye Development: Evidence from Experimental Mouse Chimeras." Investigative Ophthalmology & Visual Science, 1 July 2007. Web. 14 Apr. 2014. Xie, Q., and D. Ung. "Gene Regulation by PAX6: Structural-functional Correlations of Missense Mutants and Transcriptional Control of Trpm3/miR-204." National Center for Biotechnology Information. U.S. National Library of Medicine, 6 Mar. 2014. Web. 14 Apr. 2014. ↑ Fernald RD (2004). "Eyes: variety, development and evolution". Brain Behav. Evol. 64 (3): 141–7. doi:10.1159/000079743. PMID 15353906. ↑ Davis LK, Meyer KJ, Rudd DS, Librant AL, Epping EA, Sheffield VC, Wassink TH (May 2008). "Pax6 3' deletion results in aniridia, autism and mental retardation". Hum. Genet. 123 (4): 371–8. doi:10.1007/s00439-008-0484-x. PMC 2719768 . PMID 18322702. ↑ Walcher T, Xie Q, Sun J, Irmler M, Beckers J, Öztürk T, Niessing D, Stoykova A, Cvekl A, Ninkovic J, Götz M (March 2013). "Functional dissection of the paired domain of Pax6 reveals molecular mechanisms of coordinating neurogenesis and proliferation". Development. 140 (5): 1123–36. doi:10.1242/dev.082875. PMID 23404109. ↑ Gehring WJ, Ikeo K (September 1999). "Pax 6: mastering eye morphogenesis and eye evolution". Trends Genet. 15 (9): 371–7. doi:10.1016/S0168-9525(99)01776-X. PMID 10461206. ↑ Davis, L. K.; Meyer, K. J.; Rudd, D. S.; Librant, A. L.; Epping, E. A.; Sheffield, V. C.; Wassink, T. H. (2008-05-01). "Pax6 3' deletion results in aniridia, autism and mental retardation". Human Genetics. 123 (4): 371–378. doi:10.1007/s00439-008-0484-x. ISSN 1432-1203. PMC 2719768 . PMID 18322702. Callaerts P, Halder G, Gehring WJ (1997). "PAX-6 in development and evolution.". Annu. Rev. Neurosci. 20 (1): 483–532. doi:10.1146/annurev.neuro.20.1.483. PMID 9056723. Prosser J, van Heyningen V (1998). "PAX6 mutations reviewed.". Hum. Mutat. 11 (2): 93–108. doi:10.1002/(SICI)1098-1004(1998)11:2<93::AID-HUMU1>3.0.CO;2-M. PMID 9482572. Hever AM, Williamson KA, van Heyningen V (2007). "Developmental malformations of the eye: the role of PAX6, SOX2 and OTX2.". Clin. Genet. 69 (6): 459–70. doi:10.1111/j.1399-0004.2006.00619.x. PMID 16712695. Glaser T, Walton DS, Maas RL (1994). "Genomic structure, evolutionary conservation and aniridia mutations in the human PAX6 gene.". Nat. Genet. 2 (3): 232–9. doi:10.1038/ng1192-232. PMID 1345175. Ton CC, Hirvonen H, Miwa H, et al. (1992). "Positional cloning and characterization of a paired box- and homeobox-containing gene from the aniridia region.". Cell. 67 (6): 1059–74. doi:10.1016/0092-8674(91)90284-6. PMID 1684738. O'Donnell FE, Pappas HR (1982). "Autosomal dominant foveal hypoplasia and presenile cataracts. A new syndrome.". Arch. Ophthalmol. 100 (2): 279–81. doi:10.1001/archopht.1982.01030030281009. PMID 7065945. Martha A, Strong LC, Ferrell RE, Saunders GF (1995). "Three novel aniridia mutations in the human PAX6 gene.". Hum. Mutat. 6 (1): 44–9. doi:10.1002/humu.1380060109. PMID 7550230. Hanson I, Brown A, van Heyningen V (1995). "A new PAX6 mutation in familial aniridia.". J. Med. Genet. 32 (6): 488–9. doi:10.1136/jmg.32.6.488. PMC 1050493 . PMID 7666404. Mirzayans F, Pearce WG, MacDonald IM, Walter MA (1995). "Mutation of the PAX6 gene in patients with autosomal dominant keratitis.". Am. J. Hum. Genet. 57 (3): 539–48. PMC 1801269 . PMID 7668281.
van Heyningen V, Little PF (1995). "Report of the fourth international workshop on human chromosome 11 mapping 1994.". Cytogenet. Cell Genet. 69 (3-4): 127–58. doi:10.1159/000133953. PMID 7698003. Auffray C, Behar G, Bois F, et al. (1995). "[IMAGE: molecular integration of the analysis of the human genome and its expression]". C. R. Acad. Sci. III, Sci. Vie. 318 (2): 263–72. PMID 7757816. Martha A, Ferrell RE, Mintz-Hittner H, et al. (1994). "Paired box mutations in familial and sporadic aniridia predicts truncated aniridia proteins.". Am. J. Hum. Genet. 54 (5): 801–11. PMC 1918271 . PMID 7909985. Glaser T, Jepeal L, Edwards JG, et al. (1994). "PAX6 gene dosage effect in a family with congenital cataracts, aniridia, anophthalmia and central nervous system defects.". Nat. Genet. 7 (4): 463–71. doi:10.1038/ng0894-463. PMID 7951315. Epstein JA, Glaser T, Cai J, et al. (1994). "Two independent and interactive DNA-binding subdomains of the Pax6 paired domain are regulated by alternative splicing.". Genes Dev. 8 (17): 2022–34. doi:10.1101/gad.8.17.2022. PMID 7958875. Davis A, Cowell JK (1994). "Mutations in the PAX6 gene in patients with hereditary aniridia.". Hum. Mol. Genet. 2 (12): 2093–7. doi:10.1093/hmg/2.12.2093. PMID 8111379. Hanson IM, Fletcher JM, Jordan T, et al. (1994). "Mutations at the PAX6 locus are found in heterogeneous anterior segment malformations including Peters' anomaly.". Nat. Genet. 6 (2): 168–73. doi:10.1038/ng0294-168. PMID 8162071. Hanson IM, Seawright A, Hardman K, et al. (1993). "PAX6 mutations in aniridia.". Hum. Mol. Genet. 2 (7): 915–20. doi:10.1093/hmg/2.7.915. PMID 8364574. Azuma N, Nishina S, Yanagisawa H, et al. (1996). "PAX6 missense mutation in isolated foveal hypoplasia.". Nat. Genet. 13 (2): 141–2. doi:10.1038/ng0696-141. PMID 8640214.